Hotels in North America - Florida - Jacksonville, Orlando, Miami, St. Petersburg & Tampa. North America is surrounded by the Atlantic Ocean to the east and the Pacific Ocean to the west. North America is made up of Canada, Caribbean, Central America, Greenland, Mexico and the United States of America. The United States is the part with the highest population and it's also one of the most popular areas for tourists. Florida is one of the areas of North America featured on The Travellers Guide and its main cities are Jacksonville, Orlando, Miami, St. Petersburg and Tampa. A selection of 3 star, 4 star and 5 star hotels, guest houses and bed & breakfast accommodation in North America are offered by the Travellers Guide, as listed below. Please view our hotel offers page for the latest "early booking", "spa break" and "free night" special offers for a range of hotels in North America. Situated right on the beach in the famous Art Deco District, this suite-style property offers comfortable accommodations with convenient amenities on Ocean Drive in Miami Beach, Florida. This property is located on an island off Little Torch Key, Florida. It offers a marina, full-service spa, and gourmet dining. Every suite features ocean views and free Wi-Fi. Little Palm Island Resort boasts a sandy beach and outdoor swimming pool. Nestled on the Gulf of Mexico and offering a beautiful private beach, this property offers spacious suite-style accommodations and relaxing amenities in Florida's Bradenton Beach on Anna Maria Island. 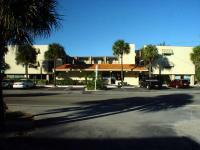 This hotel is located on Naples Bay and is within a 5-minute drive of downtown Naples. This hotel offers 3 restaurants and a private balcony in every room. Rooms at the Cove Inn on Naples Bay include a microwave and refrigerator. Located in the city's historic district, the resort is ideally situated, just a short walk or bicycle ride away from the beaches and the historic Naples Pier. Enjoy the area's array of restaurants, galleries, boutiques and shops. This Ocoee, Florida hotel is located 16 minutes' drive from Walt Disney World Resort. It features an outdoor swimming pool and free Wi-Fi access. A refrigerator is available in each room at Fairfield Inn and Suites Orlando Ocoee. On the corner of the famed Fifth Avenue and 55th st. in the heart of Manhattan, this luxurious hotel features a full-service spa, elegant guestrooms and a rooftop bar offering stunning city views. Located just 5 miles from the Lowry Park Zoo, this all-suite hotel in Tampa includes a fitness centre. It provides an outdoor pool and hot tub while rooms include free Wi-Fi. Located directly on Boca Ciega Bay and walking distance from the beach, this hotel has a private fishing pier. It features an outdoor pool, free Wi-Fi and rooms provide refrigerators. Only a 5-minute drive from the Jacksonville International Airport, this hotel offers a free shuttle service. It also offers a continental breakfast, an outdoor pool and rooms with a refrigerator.